There will be less discussion about how the FBI spent years hunting for a man who witnesses say accompanied McVeigh on the day of the bombing. They called this accomplice John Doe #2 and theories about his identity range from an Iraqi named Hussain Al-Hussaini, to a German national described below, to a neo-nazi bank robber named Richard Guthrie. The Justice Department finally gave up its search and said it was all a mistake— that there was never any credible evidence of a John Doe #2 being involved.
" U.S. District Judge George Daniels in Manhattan ruled that the lawsuit may proceed, citing the 2016 Justice Against Sponsors of Terrorism Act, which Congress passed by overruling a veto by President Barack Obama, who opposed the law because of the possibility U.S. troops and other government entities could be exposed to lawsuits in other nations. Daniels also based his ruling on the plaintiffs’ deposition of Zacarias Moussaoui, an Al Queda operative currently serving six life sentences in U.S. federal prison for his role in the 9/11 attacks. “According to Plaintiffs, Moussaoui’s testimony establishes new facts showing that the Moving Defendants aided Osama bin Laden and al Qaeda by providing funds and other forms of material support in furtherance of the 9/11 Attacks,” Daniels wrote. In addition, Daniels said the plaintiffs may obtain discovery evidence regarding allegations that two Saudi government agents in California provided assistance to several of the 9/11 hijackers. Graeme MacQueen returns to Our Interesting Times to discuss his article "9/11: The Pentagon's B-Movie." We talk about how the terrorist attacks on September 11, 2001, however real, were also eerily similar to a movie plot and thus indicate the "9/11 movie" to be a carefully scripted event directed and produced by the Deep State. Graeme is a retired member of the Religious Studies Department at McMaster University in Hamilton, Ontario, Canada. He earned a doctorate in Buddhist Studies from Harvard University and helped found the McMaster's Centre for Peace Studies in 1989. Graeme is the former co-editor of The Journal of 9/11 Studies and the author of The 2001 Anthrax Deception: The Case for a Domestic Conspiracy. A Preview Chapter For The Upcoming Book "We Were Lied To About 9/11: The Interviews"
Hello. I am currently working on another book called "We Were Lied To About 9/11: The Interviews." Each interview has already been transcribed, and I am in the process of editing them now. When I started this project I never realized how important it would actually be. I've already posted so many quotes from the parts of the book I've worked on. I'm not tooting my own horn, I'm not saying this for ego purposes, I'm not bullshitting anyone. This book will simply blow people's minds. Here is a preview Chapter. It's the second interview that I did with Mickey Huff of ProjectCensored. I'm sharing this one because the "news" has been the biggest obstacle towards getting truth, accountability and justice for what happened. I would think the book would be done by June, but I could be wrong. A large number of entries have been added to the Complete 9/11 Timeline at History Commons, the majority of which provide new details about the events of September 11, 2001. 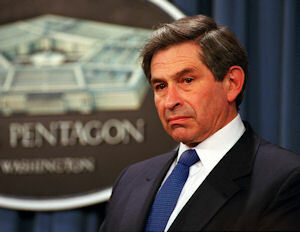 Deputy Secretary of Defense Paul Wolfowitz had a crucial role to play in the military's response to the terrorist attacks on September 11, 2001, and yet he did nothing to help protect his country until the attacks were over and it was too late for him to make a difference to the outcome of the crisis. Why Did the Top Army Officer in the U.S. Do So Little in Response to the 9/11 Attacks? 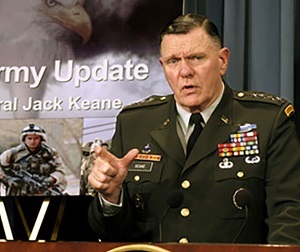 General John M. "Jack" Keane was the most senior Army officer in the United States on September 11, 2001. Working at the Pentagon, he was ideally placed to respond promptly and effectively to the terrorist attacks that day. And yet he appears to have done alarmingly little while the attacks were underway. The only action he has recalled taking after learning about the crashes at the World Trade Center was ordering that the Army Operations Center (AOC) at the Pentagon be brought up to full manning. He apparently did not order the activation of the Army's Crisis Action Team (CAT), even though this was designed for dealing with emergencies like the one taking place at the time. On 5/7/2009, New York Times columnist Frank Rich went on the Rachel Maddow show, and shared his belief that the DoD Inspector General's office's investigations over the years may have been cover-ups that were "carried out in response to "orders from above." He said that any report "over the past five or six years during the war in Iraq" may be suspect, and that "there may be a much bigger story here." In 2006, two reports were released from the DoD Inspector General’s Office. One on 8/5/2006, and one on 9/21/2006. Calling OUT Bravo-7 A Short Film by Firefighters (HD version) from Matt Campbell on Vimeo. New (?) video by and for fire fighters.